Look at that chicken! FLESH! FLESH is the title of the most recent project by artists Victor Ivanov and Lewis G. Burton. It took place in public yesterday afternoon in Trafalgar Square in London. 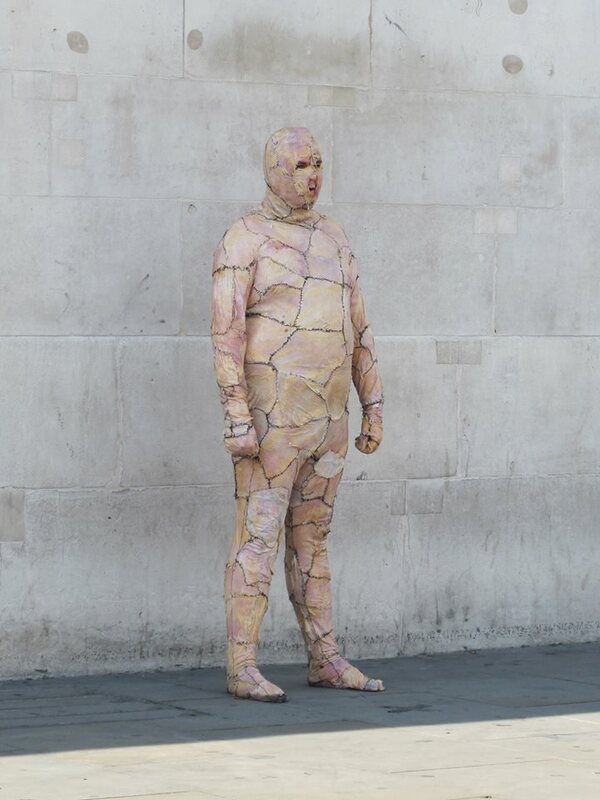 Have you ever seen – or ‘smelled’ would also be appropriate– a man walking around in a chicken suit? I did, and I was not the only one. Lewis was wandering around one of London’s most popular landmarks, sometime posing to be admired – or ‘to get disgusted gazes’ would also be appropriate – and SURELY photographed. Not by coincidence, in fact, the goal of the project is “to go viral” as Victor Ivanov says. FLESH is an experimentation that wants to investigate the link between identity and its commodification through social media, and it does so by constructing a chicken-skin’s character – useless to stress how the chicken can be the symbol of a commodified object itself – in order to be fully introduced into the social sphere. Can we list the FLESH happening as Performance Art? Well, this is the “$12 Million Stuffed Shark” question these days, isn’t it? A few months ago, on the occasion of a performance event I was organising, someone pointed out to me that that wasn’t Performance Art but Live Art. I found this comment interesting, especially because my impulsive reaction was to reply: “Isn’t Live Art a form of Performance Art?” However, I tried to make up my mind in this regard and did some in depth research in order to clarify my discourse for the future. Defining performance and performativity is a task that I have already been carrying out for a while. In relation to previous research projects, I have come across numerous definitions of performativity; all of them pool by the idea of identifying it as one of the main components of contemporary art. In his 2008 Topology of Contemporary Art for instance, art critic, media theorist and philosopher Boris Groys stated that “Today, the term ‘contemporary art’ does not designate art that is produced in our time. Rather, today’s contemporary art demonstrates the way in which the contemporary as such shows itself – the act of presenting the present. In this respect contemporary art is different from Modern art, which was directed toward the future and it is different also from Postmodern art, which was a historical reflection on the Modern project. Contemporary ‘contemporary art’ privileges the present with respect to the future and to the past. […] What differentiates contemporary art from previous times is only the fact that the originality of a work in our time is not established depending on its own form, but through its inclusion in a certain context, in a certain installation, through its topological inscription” (Groys, 2008: 71-74). The performativity, i.e. contemporary relevance, of an artwork is therefore determined by the immediacy of its interaction with both the context and the people that take part in it. Interactions consequently generate an exchange of information between the space, the work and the active audience or, to say it with other words: interactions generate networks. Lastly, one could argue that contemporary art is synonym of installation and performance – where installation is the act of installing and performance is not necessarily meant as performance art, but as the act of enacting and embodying the space – able to generate a chain effect of participatory actions and exchanges in a specific, circumscribed temporality, and followed by the establishment of networks. Performance Art, in this respect, can be seen as an expression of contemporary art that finds in performativity its manifest raison d’être. It comprises of a performance, i.e. a happening/event, accessible to an audience in an interdisciplinary way – both live and not – and can simultaneously take different shapes. Live Art is one of these, but not only. It has in fact to be intended more as a cultural strategy, investing in ideas of process, presence and experience as well as in the production of objects or things. More importantly, according to artist Joshua Sofaer, “Live Art may incorporate many other elements than performance but is founded in a conceptual framework where the performer, the director, the ‘doer’, is the artist” (http://www.joshuasofaer.com/2011/06/what-is-live-art/. Accessed: July, 20, 2014). The term became of use in UK in the mid-1980’s to acknowledge those practices that were going beyond the single act of the performance, encompassing a research that put the body at the centre of the attention, in reaction to the logics of the market. Thus, moving the discussion back to the FLESH performance and project, it needs to be said that the chicken-suit is not the only protagonist of this research, but rather a prop. An entire catalogue of products, the FLESH BOUTIQUE, is available to the public to buy as a collection of “accessible” items, e.g. videos of FLESH aerobics, photographs, etc. All in the spirit of the most contemporary consumer culture, the provocative message between the lines seems to be: BUY FLESH! More in this regard can be found in: La Rosa, M. (2013), To Collect or not To Collect: that is the question. the in-terms contradiction of contemporary art museums (https://www.academia.edu/4457235/To_Collect_or_not_to_collect_that_is_the_question_the_in-terms_contradiction_of_contemporary_art_museums). “$12 Million Stuffed Shark” is the title of a 2008 publication by Donald Thomson that tries to address the issue of contemporary art’s economic value, through a parallelism between works of art and the Art Market. – Groys, B., (2008) ‘The Topology of Contemporary Art’ in (eds) Terry Smith, Okwui Enwezor , and Nancy Condee, Antinomies of Art and Culture: Modernity, Postmodernity, Contemporaneity (Duke University Press, 2008), pp. 71–80. – Thompson, D., (2008), The $12 Million Stuffed Shark, Toronto, Doubleday Canada.